Home » Posts Tagged "indoor planting"
Herbs are great for your health, and also lots of fun to grow, if you grow them yourself. 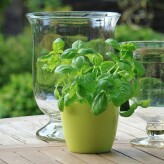 You can start your own herb garden indoors, especially if you have a windowsill that gets plenty of sunshine and air. As the weather gets cooler, it would be a great time to start your own indoor kitchen garden. Herbs are great for a quick salad and also for cooking. You can grow a variety of herbs and vegetables indoors that require minimal care and give you great results.